I have seen time and time again the enormous benefit of starting kids on balance bikes early. 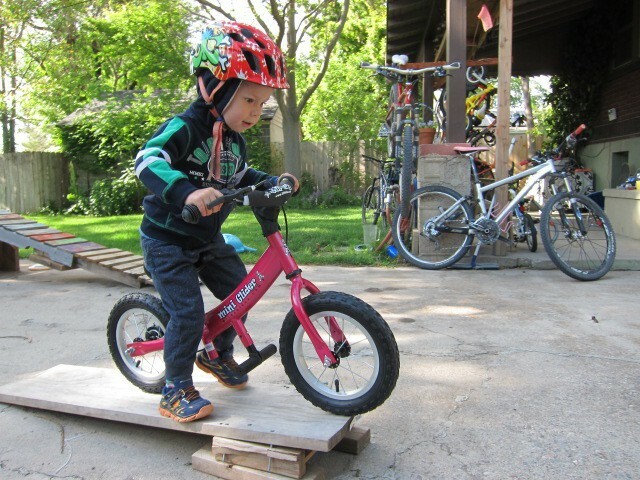 Toddlers who begin on a balance bike at 18 months are likely to be pedaling by 2.5 or 3 years old. My own son began riding a Haro Balance Bike around 14 months old, started tentatively pedaling at 2.5, and then was flying by 3. He’ll never know or experience the fear and tears and blood associated with learning to ride a pedal bike like I did as a kid! If you’re still not sold on balance bikes, I suggest reading this article: Benefits of a Balance Bike: 7 Reasons Your Toddler Needs One Now. The bikes on this list are chosen specifically for toddlers (not pre-schoolers). 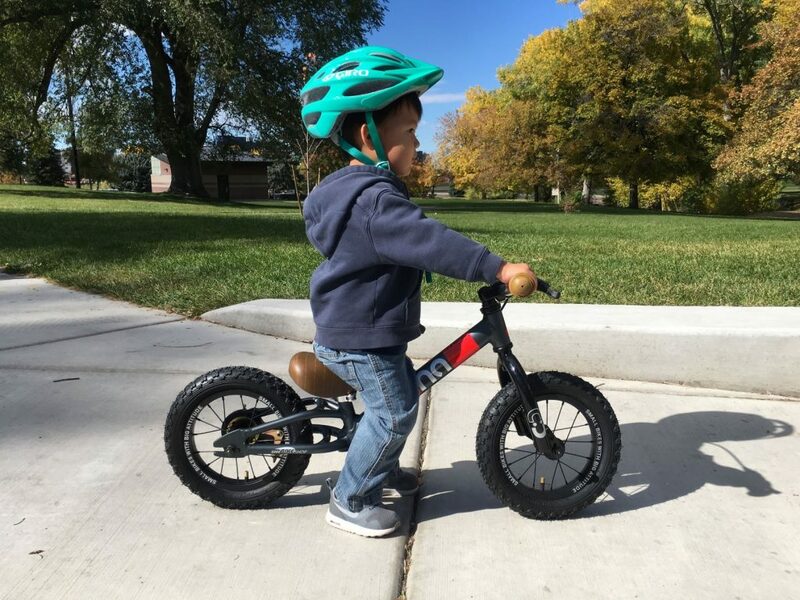 They will fit even the tiniest riders (starting around 18 months) and will grow with them for a few years until they’ve launched to a pedal bike. Note: If you have a 3, 4, or 5 year old and are just now looking at getting a balance bike, consider a choice from our list of The Best Balance Bikes for 3 to 5 year Old. 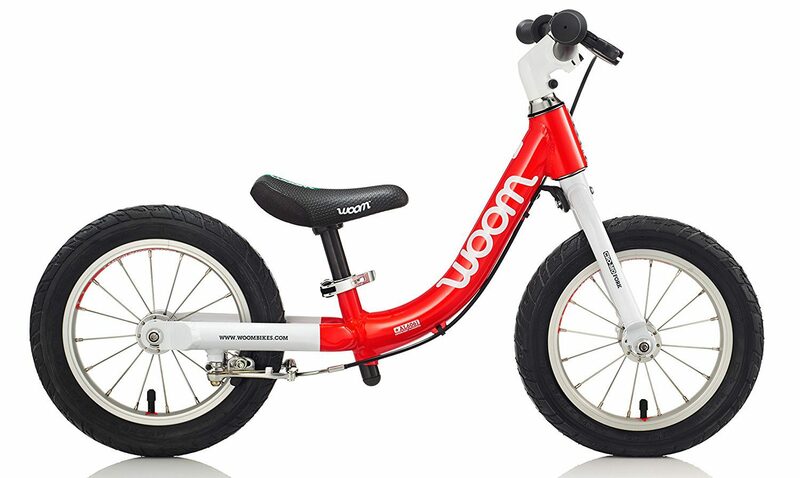 No matter the age, Woom bikes are as nice as they come. The Woom 1, the smallest bike in the Woom line-up, is truly top-notch. If you can afford it, there is no doubt that this bike will perform for your little one. 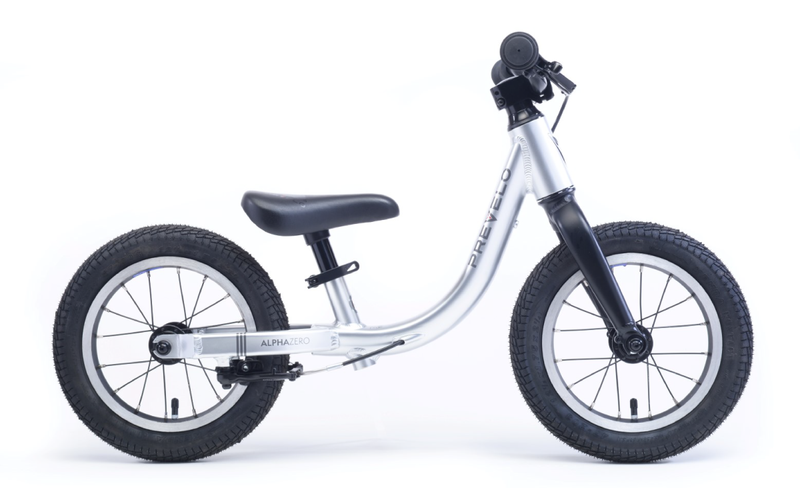 The upright geometry and long wheelbase make the Woom balance bike stable and easy to cruise on. And at a mere 8 pounds, this bike is super light making it the best balance bike for an 18-month-old. The Prevelo Alpha Zero is as pretty as it is functional. The sleek brushed-aluminum frame is lightweight and boasts internal routing for the brake cable to keep things clean and tidy. 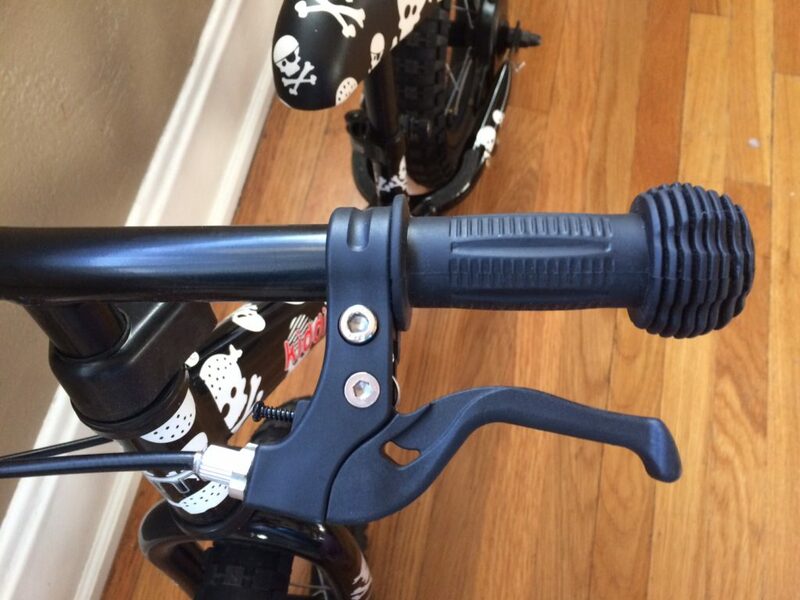 Speaking of brakes, this little balance bike has an easy-to-pull, easy-to-reach Tektro handbrake. That, along with pneumatic (air) tires, quick-release seatpost, and optional custom-color grips, make the Prevelo a top-pick. It’s the best balance bike for your 2-year-old. 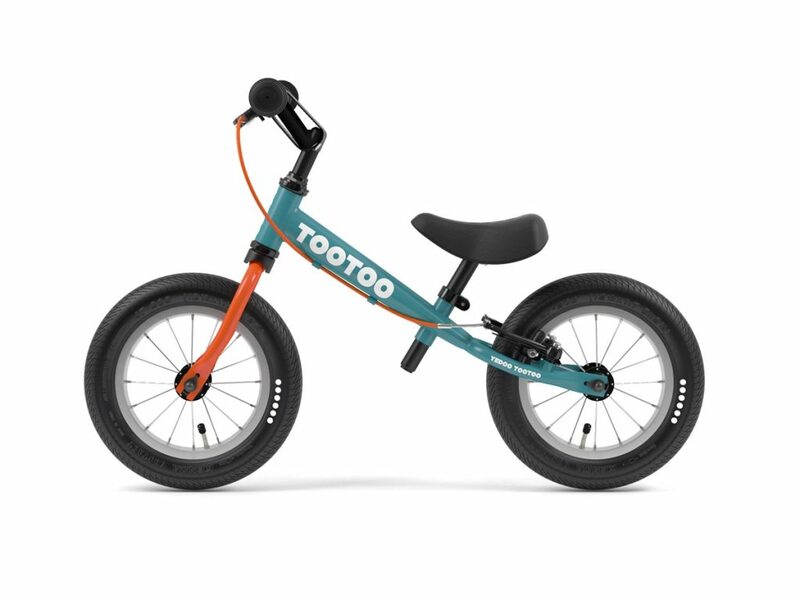 If you want the prettiest balance bike on the market, the Yedoo TooToo is the winner. The bike comes in an array of beautiful color schemes and has a pleasing aesthetic. Of course, we wouldn’t include a bike on our Top 5 list just for looking good. The Yedoo TooToo also performs. It includes pneumatic (air) tires, a rear v-brake, and reflective dots on the tires. For more information, read my detailed review of the Yedoo TooToo. 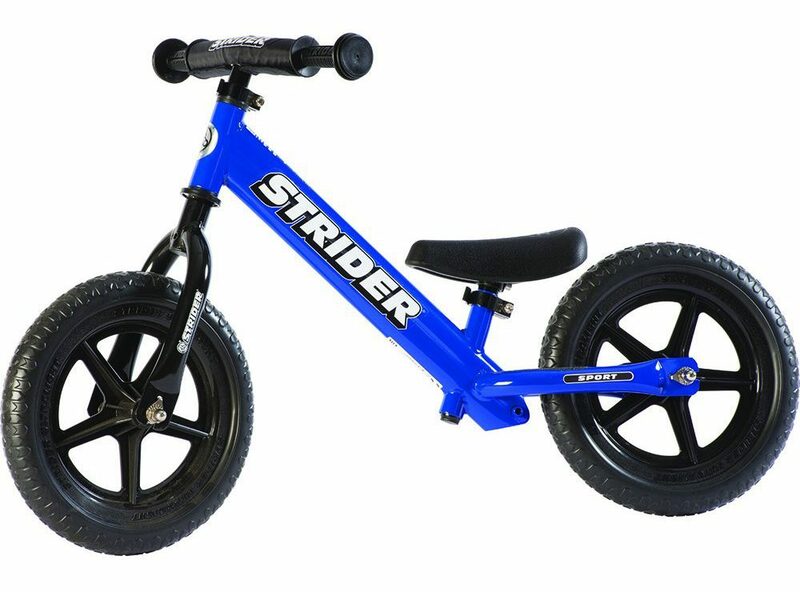 Strider has managed to so dominate the balance bike market, many people use the word “Strider” and balance bike interchangeably. The Sport version will last from 18 months to 5 years and comes with an extended seatpost and a quick-release to make seat adjustments easy. We don’t love the fact that it doesn’t have pneumatic (air) tires, and it lacks a brake, BUT it is lightweight and comes in at a reasonable price. It also gives you access to Strider races, which wins it a place on our Top 5 list. Read my full review of the Strider. 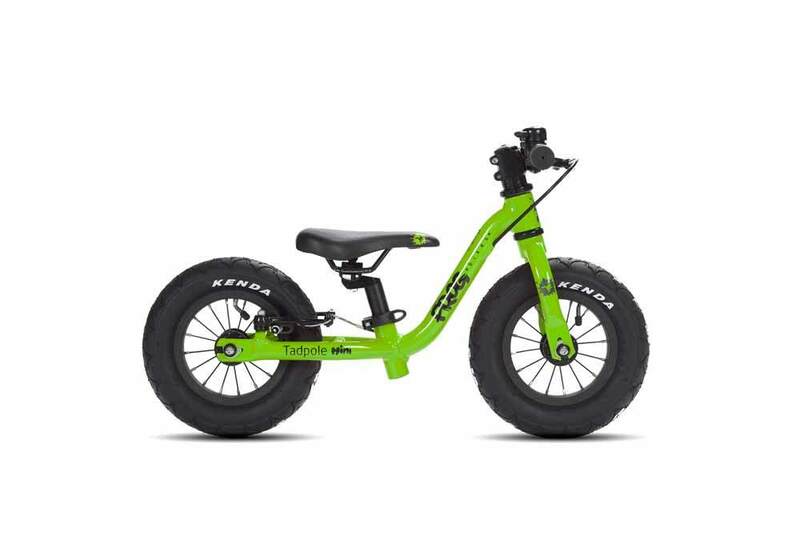 If you have a seriously mini rider, consider the Frog Tadpole Mini which will fit the very smallest toddlers. This bike is one of only a few on the market with 10″ wheels and has an incredibly low minimum seatpost height of 9.5.” It also has pneumatic (air) Kenda tires and a rear handbrake which quite frankly is a bit unnecessary considering your child will likely outgrow it before they are old enough to learn how to use a handbrake. We only recommend this bike if you are super antsy to get your child riding since you will probably have to buy a larger balance bike before your kiddo is ready for a pedal bike. These balance bikes didn’t make our Top 5 list, but they are still worth a look. This bike doesn’t have all the bells and whistles and safety features that some of the other bikes on this list have, but it holds a special place in my heart as it was my son’s first real bike (he did have a pre-bike first). The Haro is the only bike on this list with 10” wheels, and the small wheels and tiny frame make it very manageable for particularly small children. My son was 14 months old when he got this bike for Christmas, and we recently handed it down to another little boy who was too small for a Strider. Read my full review of the Haro PreWheelz 10. 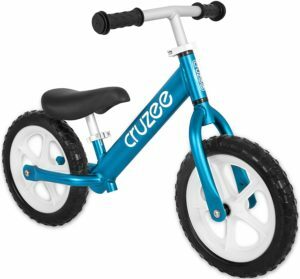 The best thing about the Cruzee balance bike is how good it looks. The beautiful anodized frame comes in multiple fun, bright colors. At 4.4 pounds, the Cruzee is as light as they come, making it ideal for particularly petite children. 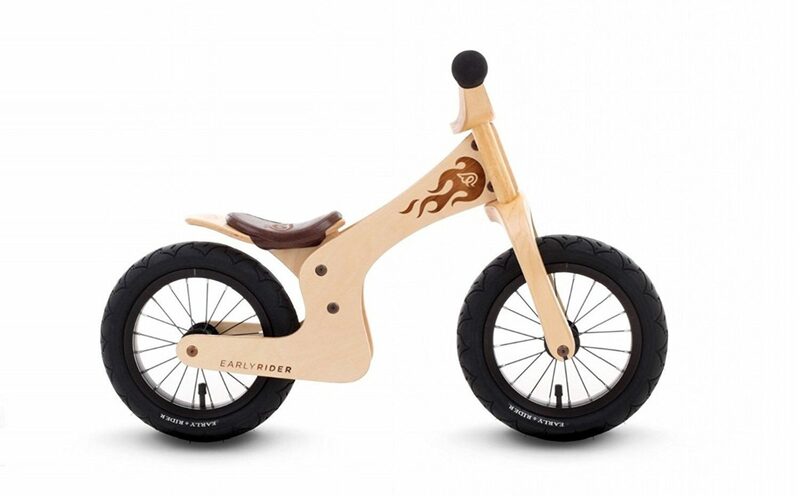 No balance bike list would be complete without an eco-friendly wooden frame. Made of marine-grade birch, this bike is just a beautiful as a nursery decoration as it is fun to ride. With high-quality parts and a 100 pound weight limit, this bike is sure to last for years (in your garage, not a landfill)! 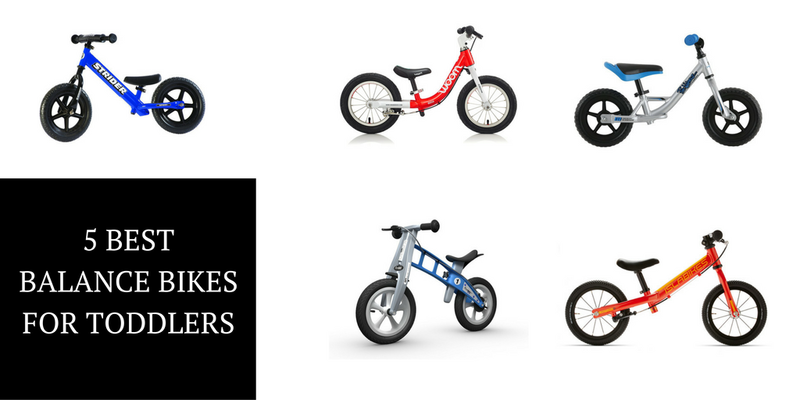 Like Woom, Islabikes is another company that has specialized in making fantastic bicycles for all ages of children. While pricey, these bicycles have quite the following and always sell well on Craiglist (something to keep in mind if the price tag makes you bristle). The minimum seat height on this bike is a bit higher than others (11.5”) so if you have a particularly tiny child, keep that in mind. 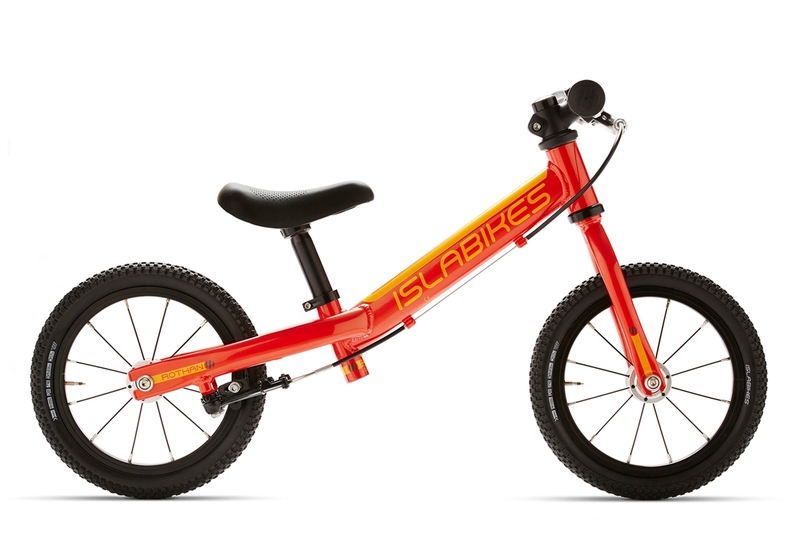 Note: As of Fall 2018, Islabikes is no longer selling their bikes in the U.S. market. We are leaving the bike on the list in case you are fortunate enough to live in the European market or if you manage to find one used. So how do all these bikes stack up? Use this handy chart to compare price, weight, seat height, etc. For more information on each category and on what’s important, continue reading below. Balance Bike Wheel Size MSRP Suggested Age Seat Height Frame Material Tire Type Bike weight Brake? Multiple colors? Here are the most important things to consider when shopping for a balance bike for your toddler. If you want to be even smarter on the topic, learn about our top 7 things to look for when buying a balance bike. Weight is a crucial deciding factor for bikes for kids of all ages but is even more important when we are talking about the 2 and under crowd. Toddlers who are just learning get frustrated easily, and the lighter weight the bike is, the more likely there are to succeed in their efforts (without a temper tantrum). When comparing two bikes of the same price, pick the lighter one. At 18 months, toddlers do NOT have the coordination required to use a handbrake. At this point, their feet work just fine as a brake. For that reason, I do not make a handbrake a big deciding factor when choosing balance bikes for toddlers. That said, by 2.5 to 3 years old, kids begin to be able to use the handbrake and it is good practice for children getting ready to transition to a pedal bike. So, if you plan on your child using this bike for several years, consider buying one with a handbrake. The younger and smaller your child, the more important the minimum seat height. If you put a child on a bike that is too big for them, they are inevitably going to crash, get hurt, and become quickly frustrated. Before buying a bike, measure their inseam and choose a bike with a minimum seat height no larger than their inseam. At this age, kids need to be able to put their feet flat on the ground when seated. Plan on spending a minimum of $100 for a balance bike. If that is outside of your budget, consider searching on Craigslist or asking friends about buying a used bike. A decent used balance bike is generally a better choice than an inferior cheap balance bike. If price isn’t an issue (thanks Grandma and Grandpa! ), then go straight for the Woom 1 or Prevelo Alpha Zero. You won’t be sorry. 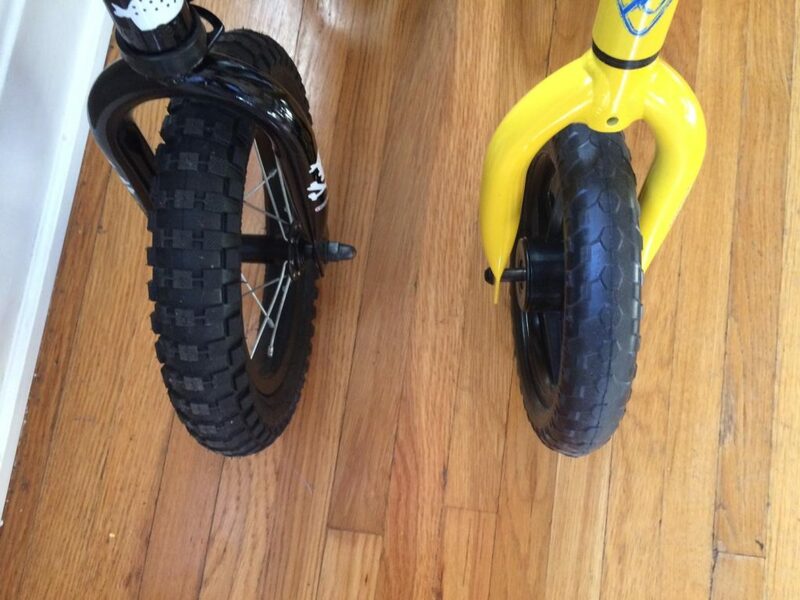 You have two options when it comes to balance bike tires: foam/plastic or pneumatic (air). The foam or plastic tires are nice in that they never go flat (woohoo! ), but my preference is always the pneumatic (air) tires. Why? Because they offer superior traction when riding on grass, dirt, and gravel. While this may not be that important at 18 months when your toddler is likely to be riding on the driveway or even the kitchen, you’ll be surprised how quickly they become more adventurous and daring. Even within the narrow “toddler” category, there are different things you should be looking for based on how old the child is that you’re shopping for. 18 months – The best balance bike for an 18 month-old is going to have a VERY low minimum seat height and a VERY light weight. A brake at the age is totally unnecessary, but is nice to have if you plan on keeping the bike around for a while. The same can be said for tires. At 18 months old, foam tires can be nice for riding inside the house, but by 2 or 3 air tires are the better bet. 2 years old – By 2 years old, you can skip the 10″ wheels and go right for a 12″ balance bike. 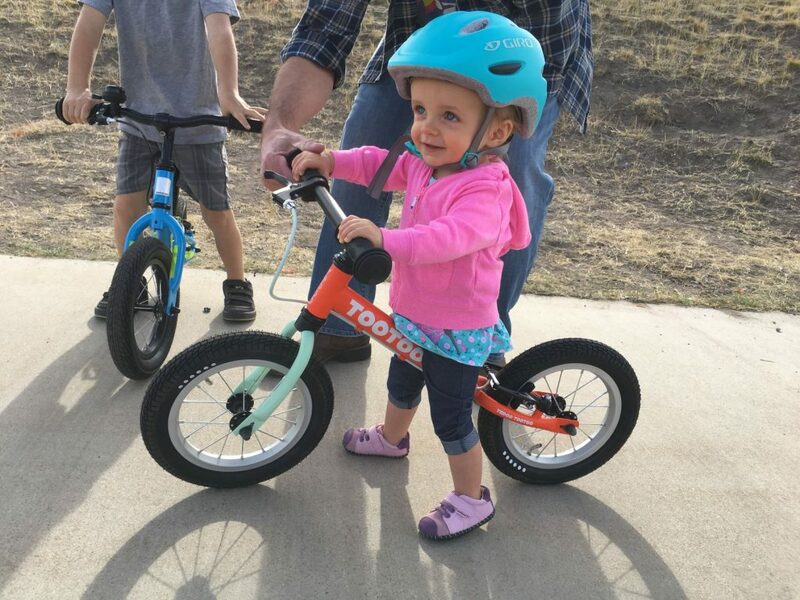 Pick a bike that will last a year or two, until your toddler is ready to switch to their first pedal bike. 3 years old – If your child (or grandchild) is already in a 3T pant, consider buying a balance bike off our list of best balance bikes for pre-schoolers instead. If they are on the smaller side, stick with a bike on this list but make sure that it has a brake, a high maximum seatpost height, and pneumatic (air) tires. By 3, kids are pretty aggressive on the balance bike. Is Cruzee USA going out of business? I can’t get a hold of anyone for replacement parts. This is HORRIBLE service for the amount paid for the bike.